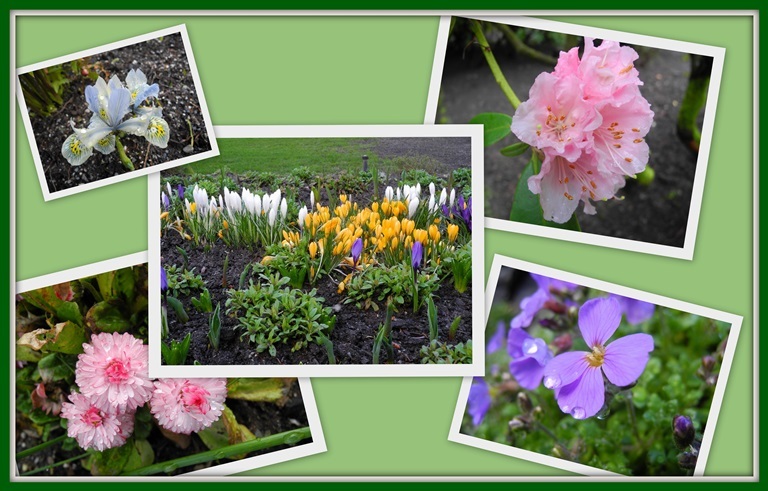 My visit to Butchart Gardens resulted in a LOT of photos. Here are the last I'll share for now, until the next time I visit and see many more beauties. You can visit my two previous posts for more. Our city has the mildest weather in Canada and that's never more apparent than at this time of year. On Saturday morning I awoke to the sound of birds twittering (in the old-fashioned way) outside my window. Tim and I spent much of the day in the yard, weeding, pruning roses, clipping bushes. My garden beds are almost ready for spring planting. But before doing that, I needed to harvest more of my winter garden. Rainbow chard, kale, and underneath is purple broccoli. More chard awaits cutting. This winter was so mild that some lettuce plants survived our few frosts. This was my first time planting chard. I'd love to know if you cook it and if so, how. I've added it to soups, but that's about it. If you have ideas, please let me know! I grew up steaming the swiss chard and then adding butter, salt and pepper. Lovely harvest from your winter garden. The blooms are so pretty. You have a harvest! I'm so impressed, Lorrie. My grandparents used to grow chard in their Cape Breton garden; I'd be tempted to treat it like spinach. With the vegetables and flowers, you have such wonderful colour in this post. The flower mosaic is lovely! What a great harvest, I am impressed to see these in the winter. Lovely images have a happy week! Have a look at www.bbc.co.uk/goodfood. there are some useful recipes using chard. I've always cooked the stems separately as they take a bit longer. You can stir fry the stems. Don't be stingy with those flower photos now! Some of us will need the encouragement, though even in my snow-covered world, I have signs of spring. The chickadee was singing his spring song and I have daffodils up with three buds upon them. Since they're only inches from a snowbank, I'm impressed with them. This is such a nifty way to do a collage and I have never figured out how it is done. Love your spring time photos. We too spent Saturday in the yard and it felt so good even though there still was a chill to the air, I think spring is here. When we had gardens we always grew Swiss Chard. We washed the leaves, boiled a small amount of water...an inch or two in a BIG pot with a pinch of salt, just boil the chard until it wilts down into the water and drain. (a matter of a few minutes) Put a spoon full in a small bowl, cut it, butter it and splash it with white vinegar. It is the best flavor in the world of vegetables! Happy Monday! What a beautiful, colorful, spring-y mosaic! Our Creator is lavish! You have a green thumb, Lorrie, and the greens to prove it! I've used chard in stir fry, in pasta sauces, in spinach salads, and as a treat for Mayo (the bunny). My daughter includes chard in her carrot, ginger, kale healthy lunch drinks. We planted peas today in the sunny boxes out back. Now I'm eagerly waiting for the first fresh pea of the year! Oh! I am crazy over swiss chard and just look at your lovely bunch! I love your little wire basket too-Your mosaic is perfectly inspiring for a Monday morning!! What a treat it would be to go to Butchart Gardens-this coming Friday two of my daughters and grand babies and I are going to Dallas Blooms at the Dallas Arboretum! I can barely wait!! To prepare chard can be as simple as preparing spinach. Just put a cleaned bunch (more than you'd think you'd need) in a large pot with about 1/2" water in the bottom, and steam it just til wilted. If you keep it on too long, it will become more bitter. When serving to small children, I cut it up first and put it in a steaming basket, but older diners recognize that long uncut leaves can be spooled around the fork tines, like spaghetti. My grandmother used to put a huge pat of butter on top of it in the serving dish, or even sprinkle with bacon bits, but she was cooking for woodsmen who needed the calories. Serve with cider vinegar and/or lemon slices on the side. I grew up eating it with cider vinegar, but now I like it plain. If I have fussy eaters and a boring entree, I have stirred it into a white sauce with a little cheese in it, and fresh ground black pepper. Kind of a variation on creamed spinach. Enjoy! So good for you! Oh Lorrie, those look amazing... I had no idea your climate was such a mild one! I'm afraid we don't garden to your level due to space constraints and HOA restrictions. That being said, I hope to have our tiny plots humming along by next month! I'm afraid we've had a lot of cold and wet weather (for our area) these past few months so I haven't done as much as I'd have liked. Chard, spinach and more kale are high on my list to include in our fresh morning juices. I also use chopped chard (and all of the above) in soups, stews and broth. If the chard is tough I just use the leaves (using kitchen sheers to cut the leaves from the stems). I'm so enjoying your photos, as always! Ah the coastal climate...sigh. LOL. No really, I am happy up here, honestly. But I do miss the early spring, what a harvest bounty you have. I saute my chard in a little olive oil, with garlic. Delish. I love your harvest from the winter garden! Let us know what you cooked up. Enjoyed seeing all the pretty Spring color - Thanks for sharing it with us. I love seeing all the first signs of Springs. Thanks for stopping by and nice comment on the necklaces. Ok, I am rather jealous right now! Seeing the fruits of your labours on Vancouver Island, receiving a photo of tulips blooming from my son who lives in Vancouver....it all just makes me yearn for spring to arrive in Edmonton! Butchart Gardens is on my wish list of palces I'd like to visit one day in the future! Love the look of those healthy veggies - all my favorites! I use Swiss chard in pasta dishes - chop the stems small and saute in good olive oil first, then add leaves. Thanks for sharing more flowers. Now I know why everyone wants to move there...................me included, ha! ha!